A perfect gift for the coffee lover! 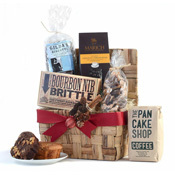 Perk up their day with our stylish basket showcasing a variety of caffeinated treats guaranteed to please. The Pancake Shop's famous House Blend is the foundation for this coffee-themed basket. The smooth, rich flavor and low acidity make this popular brew a coffee to enjoy every day. 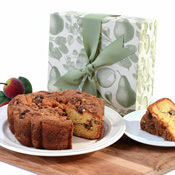 What better to enjoy with a cup of coffee than a sensational piece of coffee cake? We've included two miniature versions of the same coffee cake that was served in New York's Plaza Hotel for years. Flavors ranging from New England Blueberry to Cinnamon Walnut are sure to satisfy the most discriminating sweet tooth. Artisan Style Chocolate Espresso Biscotti from Gilda's Biscotti is a standout, combining extra dark cocoa powder and bittersweet chocolate chips with La Colombe espresso. Chocolate Espresso Beans provide an intense chocolate punch followed by a deep coffee flavor. The crunchy texture of the coffee beans provides the perfect counterpoint to Béquet Confections' Salted Mocha Caramels. We've included 20 pieces of this all-natural confection featuring one layer of salt-chocolate caramel and another of espresso caramel - a symphony of flavors! Finally, a generous sampling of Olive & Sinclair's hand crafted, small batch Bourbon Nib Brittle provides the ultimate afternoon pick-me-up with a cup of coffee! 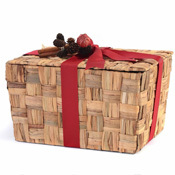 Your coffee lover's gift will arrive in our signature Hyacinth lidded basket, adorned with an elegant ribbon and decorative pick. The Pancake Shop-House Blend Coffee: A full-bodied coffee that balances acidity and sweetness to make a satisfying cup of coffee. Marich Premium Chocolates-Espresso Beans: Roasted coffee beans, covered with premium dark chocolate. My Grandma's of New England- Miniature Coffee Cakes:Two single serving award-winning coffee cakes, made with best ingredients. Béquet Confections'- Salted Mocha Caramels: Widely recognized as some of the best caramels in the country, Bequet Caramels are made with only the finest ingredients to create smooth, creamy, exquisite caramels. Olive & Sinclair's- Bourbon Nib Brittle : cacao nibs, aged in bourbon barrels and then sprinkled on top of a caramelized buttery Bourbon brittle, that is enrobed by chocolate on one side. Gilda's Chocolate- Espresso Biscotti: Italian Style biscotti with rich chocolate taste, made with cocoa powder, bittersweet chocolate chips and espresso. Dunk in coffee, milk or pair with red wine.